A smaller entry of stock this week saw steers sell to £1,215, 665kg Charolais (183.00). Heifers peaked at £1,050, 560kg Charolais (188.00). 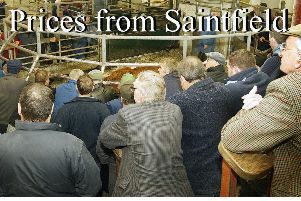 Dropped calves topped at £320 Aberdeen Angus bull and heifer calves to £335 Blonde d'Aquitaine. Weanling trade topped at £975, 445kg Limousin steer (218.00). A planner Shorthornow of steers saw prices peak at £1,215, 665kg Charolais (183.00) presented by D Reid, £1,095, 530kg Limousin (207.00); N Jenkinson £1,195, 610kg Charolais (196.00); A Bowden £1,180, 580kg Blonde d'Aquitaine (203.00), £1,145, 575kg Aberdeen Angus (199.00); A and P Quinn £1,140, 540kg Charolais (211.00), £1,140, 560kg Limousin (204.00), £940, 400kg Charolais (235.00); W Ferguson £1,100, 525kg Limousin (210.00), £1,060, 530kg Simmental (200.00), £1,050, 510kg Limousin (206.00), £1,010, 495kg Simmental (204.00); E Scully £1,070, 525kg Limousin (204.00); S Begley £1,010, 505kg Aberdeen Angus (200.00); L Donnelly £960, 425kg Limousin (226.00), £930, 395kg Limousin (235.00), £875, 380kg Limousin (230.00), £860, 405kg Limousin (212.00); Riverview Farms £900, 365kg Limousin (247.00), £880, 375kg Charolais (235.00), £835, 345kg Limousin (242.00); P Mullan £865, 415kg Limousin (208.00), £830, 340kg Limousin (244.00), £805, 370kg Charolais (218.00), £775, 335kg Charolais (231.00) and M Donaghy £850, 425kg Blonde d'Aquitaine (200.00). A small entry of heifers peaked at £1,050, 560kg Charolais (188.00) presented by C O'Brien; D Reid £1,045, 510kg Limousin (205.00), £1,040, 495kg Limousin (210.00); A McCord £1,040, 535kg Limousin (195.00); B O’Neill £1,010, 475kg Charolais (213.00), £780, 395kg Blonde d'Aquitaine (198.00); A and P Quinn £1,000, 400kg Charolais (250.00); J Hobson £900, 435kg Limousin (207.00) and P McDonnell £620, 305kg Limousin (203.00). A much larger entry of dropped calves saw bull calves sell to £330 Aberdeen Angus bull presented by a Down producer, £295 Aberdeen Angus bull, £290 x 2 Aberdeen Angus bulls, £250 Aberdeen Angus bull; M McNally £320 Limousin bull; W Smith £300 Hereford bull, £275 Hereford bull; K Hunter £300 Shorthorn bull, £285 Shorthorn bull, £240 Shorthorn bull; C Loughran £290 Hereford bull, £250 Hereford bull; A Irwin £270 Belgian Blue bull, £250 Belgian Blue bull; J Wilson £260 Hereford bull; R J V Kelso £210 Belgian Blue bull, £200 Aberdeen Angus bull; Fr bull calves sold from £26 to £90; Meanwhile heifer calves topped at £335 Blonde d'Aquitaine presented by S Johnston; A Down producer £310 Aberdeen Angus heifer, £295 Aberdeen Angus heifer; A Irwin £280 Belgian Blue heifer; D McKenna £250 x 2 Limousin heifers, £225 x 2 Charolais heifers; R J V Kelso £235 Aberdeen Angus heifer; R Givan £230 Aberdeen Angus heifer; R Crawford £225 Aberdeen Angus heifer; C Loughran £215 Hereford heifer and H Irwin £210 Aberdeen Angus heifer; W Smith £205 Hereford heifer. Weanling trade continues to hold with male calves selling to £975, 445kg Limousin (218.00) presented by A McCammon, £905, 380kg Limousin (237.00), £820, 360kg Charolais (228.00), £765, 320kg Limousin (239.00); J P Canavan £855, 360kg Limousin (238.00), £840, 345kg Limousin (241.00), £825, 370kg Limousin (225.00); J Fleming £770, 325kg Limousin (235.00), £740, 390kg Limousin (256.00); M Thom £680, 270kg Simmental (250.00), £675, 295kg Simmental (230.00), £650, 255kg Simmental (255.00), £640, 285kg Simmental (225.00); W Conn £660, 250kg Limousin (265.00), £590, 235kg Limousin (251.00), £500, 205kg Limousin (242.00); J Tinsley £590, 260kg Limousin (225.00). Meanwhile weanling heifers topped at £845, 365kg Simmental (232.00) presented by T D Forbes, £760, 365kg Simmental (208.00), £720, 320kg Limousin (225.00), £630, 260kg Charolais (241.00); A McCammon £800, 300kg Charolais (265.00), £800, 285kg Charolais (280.00); M McNally £790, 310kg Charolais (256.00) and D Scott £640, 305kg Blonde d'Aquitaine (210.00).